Behind the wooden door hides a well 20 meters long driven into the mountain area, the sooner the breweries served as ice and beer cellar (photo above). Over time, the population used it sometimes even as a refuge. 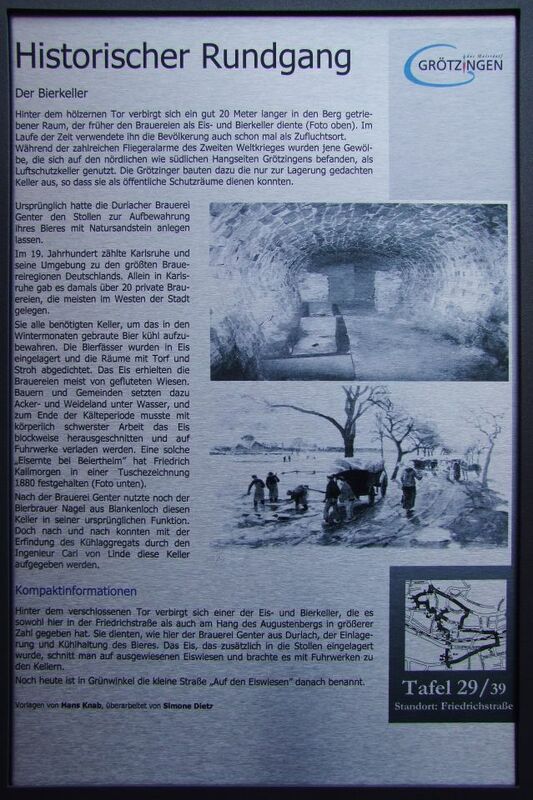 During the numerous air raids of the Second World War those vaults, which were on the northern and southern sides slope Grötzingens were used as air raid shelters. The Grötzinger built this from the imaginary only for the storage cellar, so that they could serve as public shelters. Originally, the Durlacher brewery Ghent had had to create the tunnel for the storage of their beer with natural sandstone. In the 19th century counted Karlsruhe and its proximity to the largest brewery regions of Germany. In Karlsruhe alone time there were over 20 private breweries, most located in the west of the city. All required cellar to store the brewed beer cool in the winter months. The beer barrels were stored in ice and sealed the rooms with peat and straw. The ice got the most breweries of flooded meadows. Farmers and communities continued to arable and pasture land under water, and the end of the cold period had to be cut out with physically hard labor the ice blocks and loaded onto carts. Such "Eisernte at Beiertheim" Friedrich has Kallmorgen held in an ink drawing 1880 (photo below). After the brewery Ghent still took advantage of brewers nail from Blankenloch this cellar in its original function. But gradually were abandoned with the invention of the cooling unit by the engineer Carl von Linde these basement.